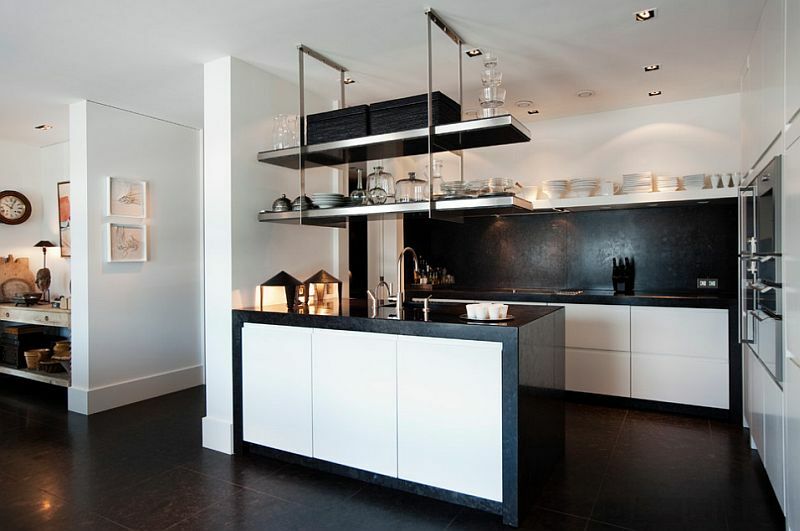 It is amazing how the use of two simple and basic colors can instantly create interiors that are both dramatic and exquisite. 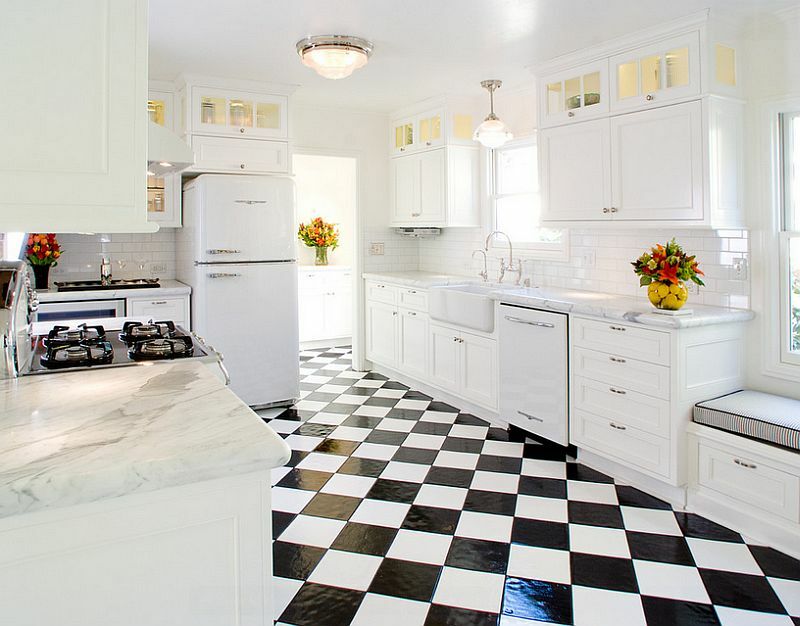 Black and white are two such colors that make a bold visual statement and do so in any design style of your choice. 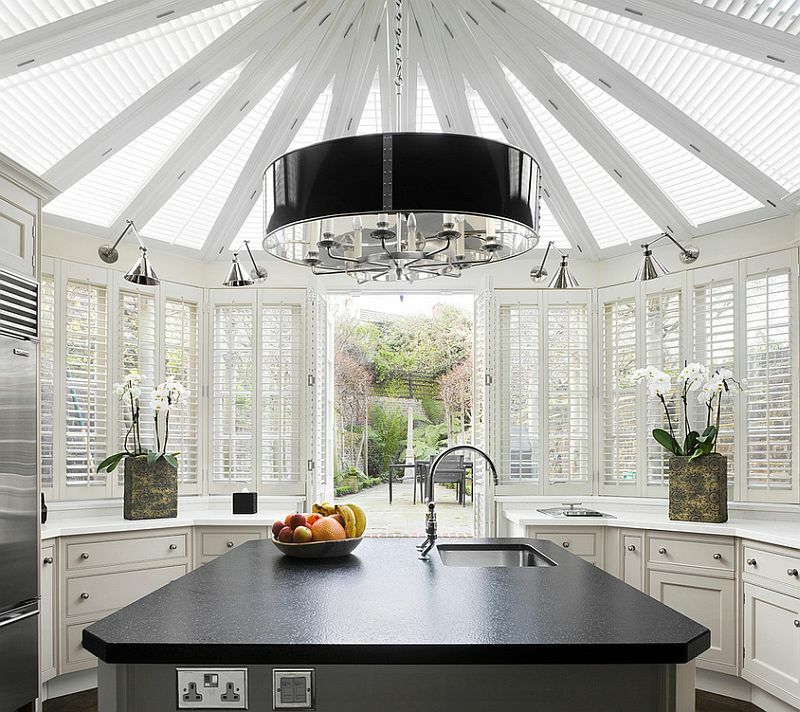 The black and white kitchen is a classic that is never ‘out of style’, making it a perfect choice for those who are not too keen on constantly changing the look of their home every year or two. 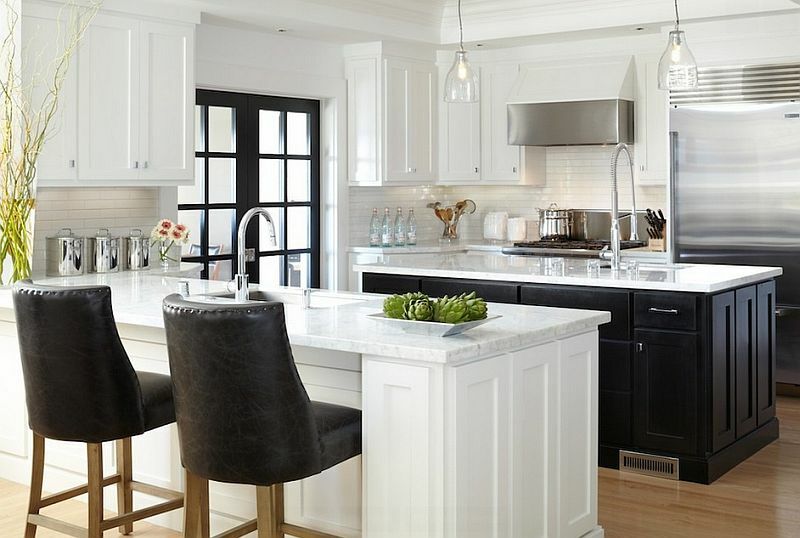 While contemporary kitchens with bright purple backsplashes and orange cabinets might fall out of favor quickly, black and white kitchens manage to always stay relevant. 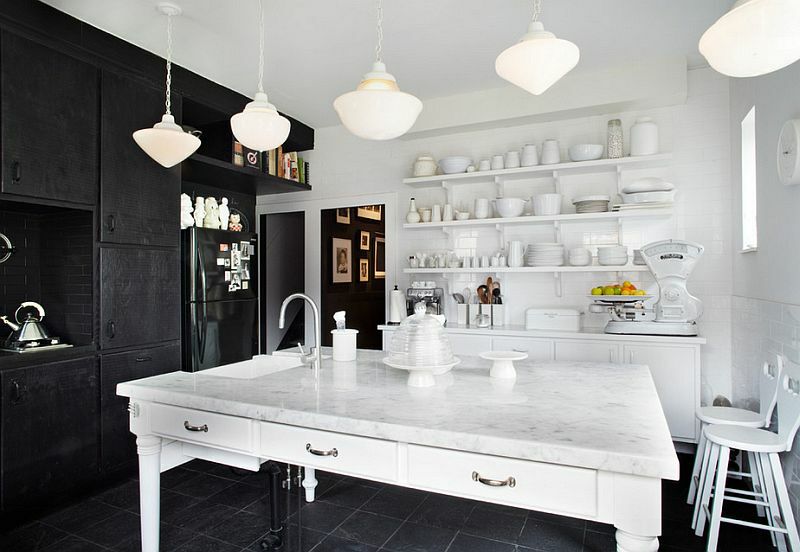 But designing and decorating a black and white kitchen is not as easy as just putting stuff in both these hues together. 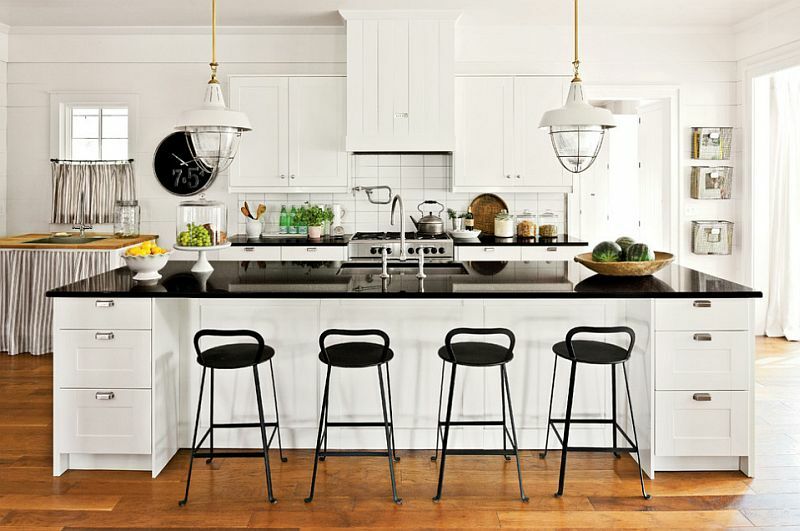 From the glamorous to the vintage and from the minimal to the traditional, here are some gorgeous and sophisticated black and white kitchens that will inspire you to give your own kitchen the monochromatic makeover! 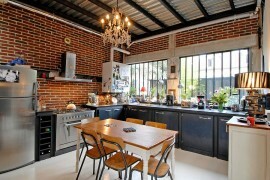 Modern kitchens are much more than mere places to cook and serve food. 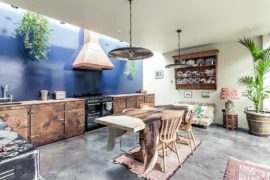 With the growing popularity of living spaces with an open floor plan, the kitchen is quickly becoming an extension of the living area and a social space to host friends and family. 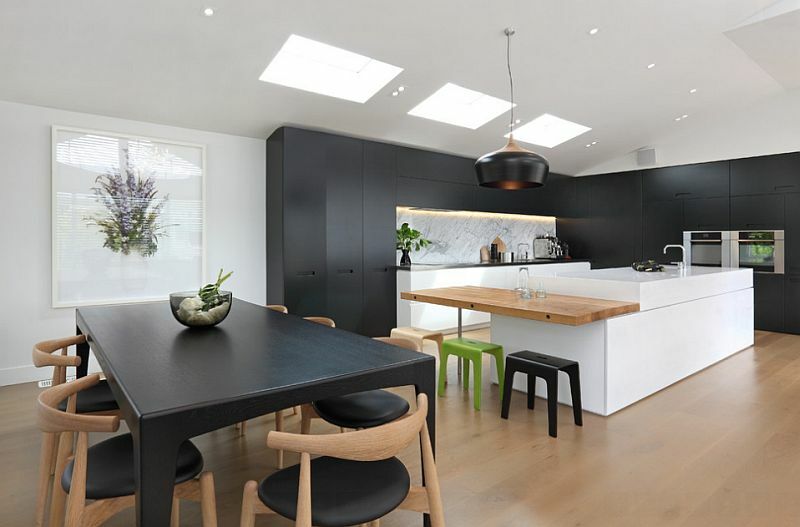 The black and white color scheme comes in handy when designing such versatile kitchens that seamlessly blend with the living area and the dining space. 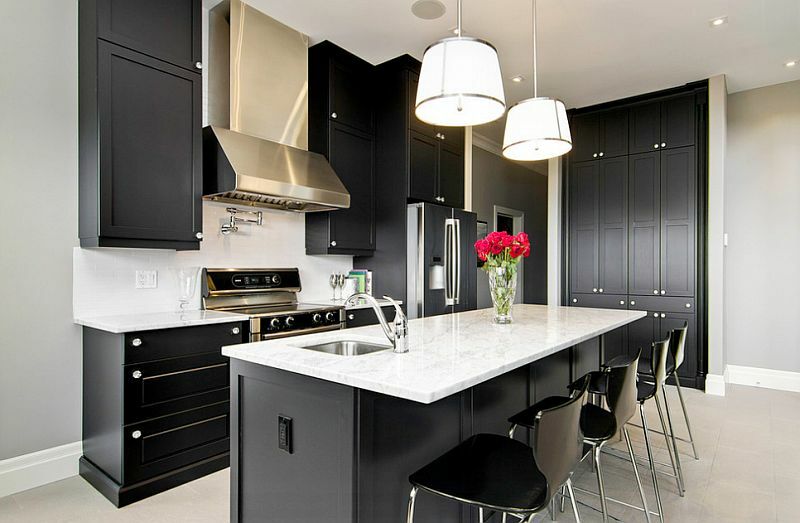 By using the monochromatic color scheme, you ensure that the kitchen stands out visually even while keeping the transition from one area of the house to another smooth and appealing. 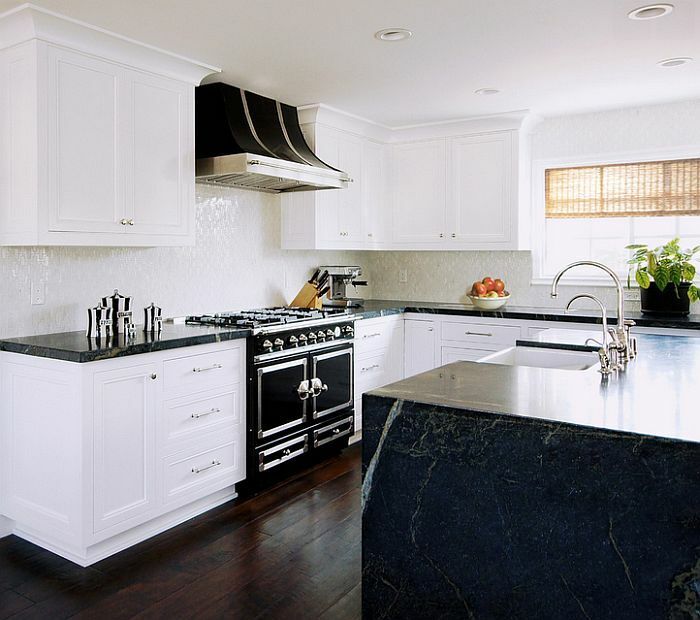 More importantly, the black and white look allows you to design a kitchen that blends in with any theme and style that you have going in the living room. 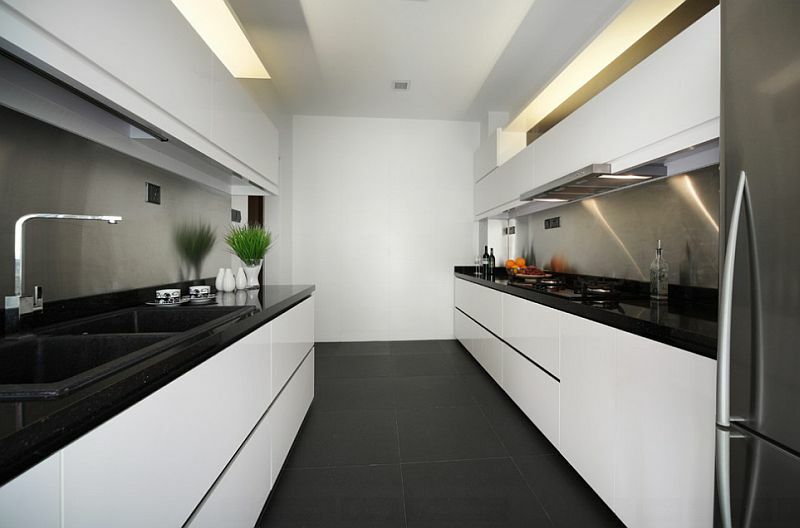 Contemporary and minimal kitchens in black and white look truly stunning. 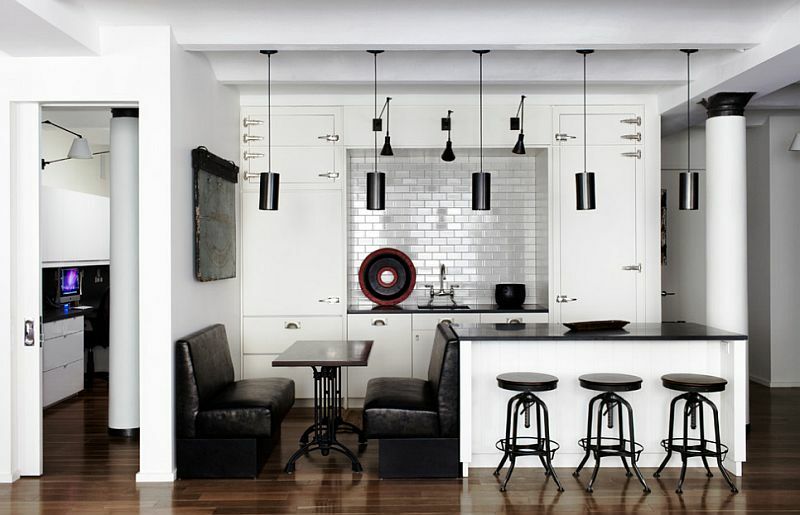 If you have a living that embrace a more vintage or even transitional style, then the black and white look fits in effortlessly here as well. 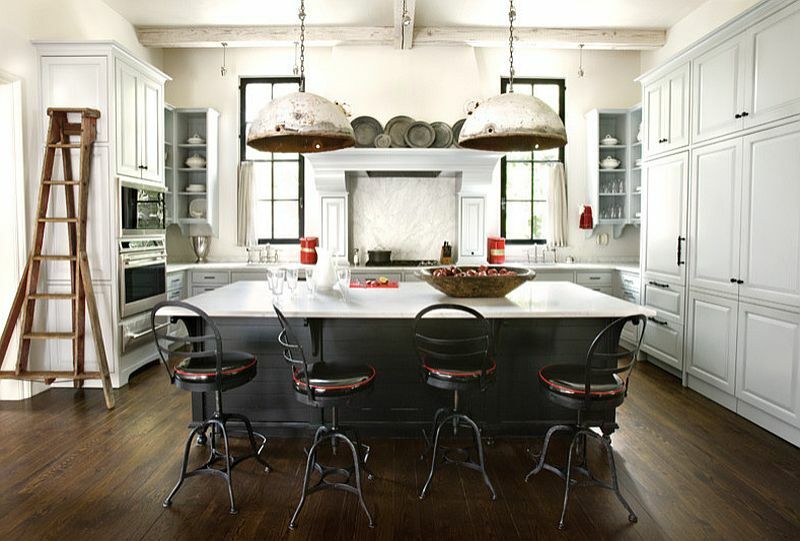 It is this adaptability of black and white kitchens that makes them trendy across different eras! 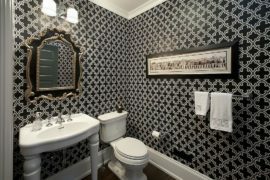 Decorating with black and white does not mean you pick the darkest blacks and absolute whites alone. 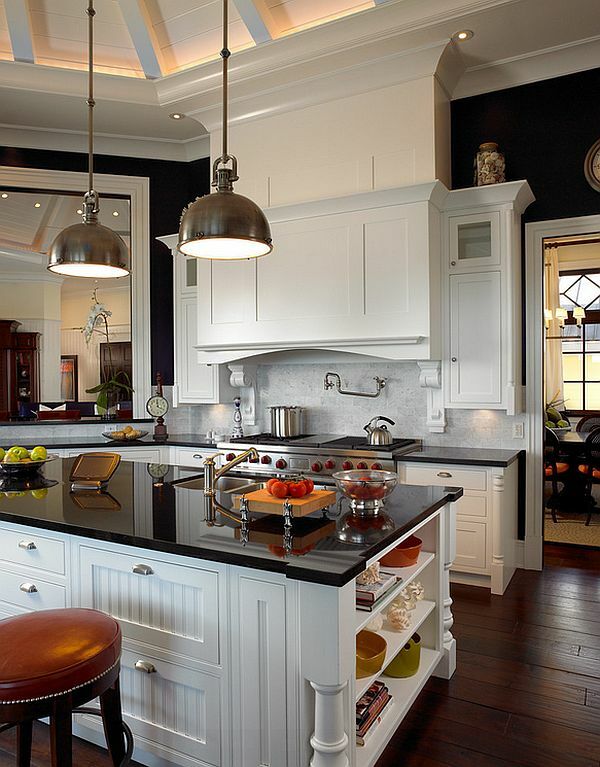 There are plenty of changes you can bring to this color scheme by simple altering the hue, shade and value of the black or white that you use. 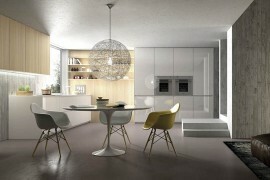 Strong greys can replace the black while creamy whites can be used in place of pristine white to fashion a novel look. 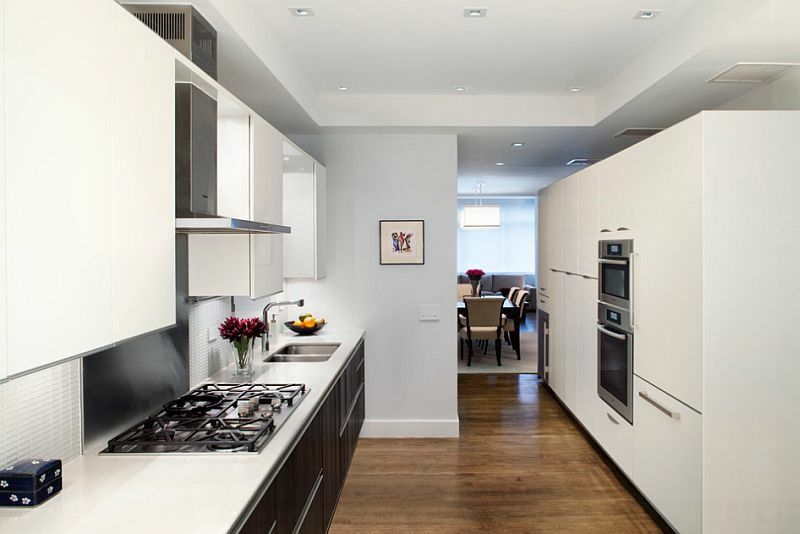 Though you still need to stick to the overall color scheme, feel free to take some creative liberty here and there to set your kitchen apart from the rest. 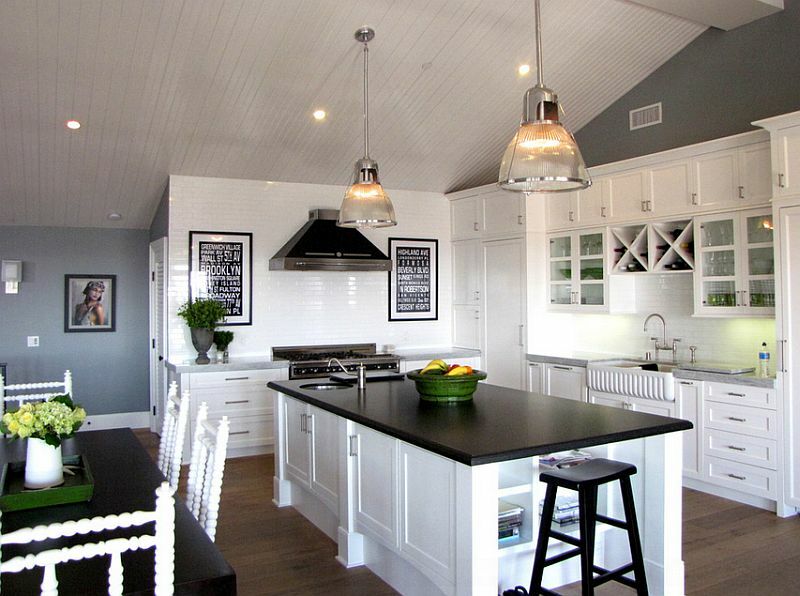 Accent colors are another wonderful way to freshen up the black and white interiors with changing seasons. 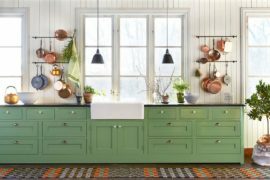 You can embrace the ‘spirit of the season’ by simply adding fabric and accessories in the hottest accent color that is doing rounds. 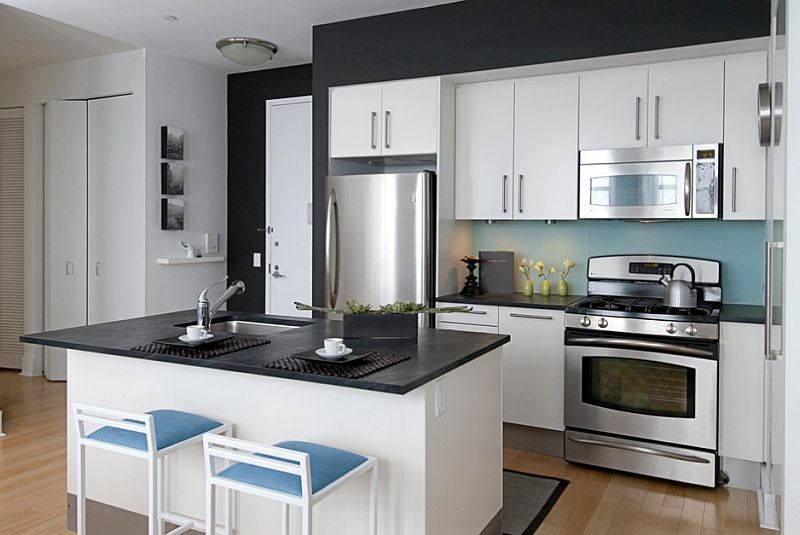 Since black and white kitchens offer you a perfect neutral backdrop, your accent additions will stand out instantly. 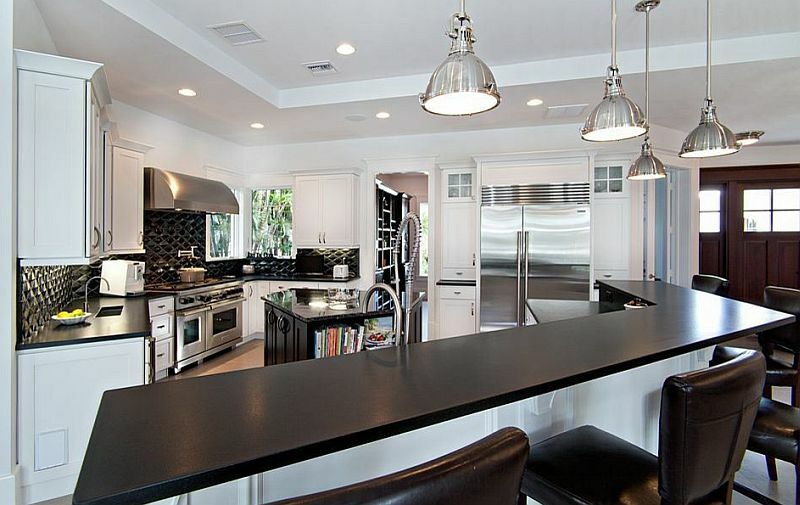 As a rule though, if you are going heavy on the black, then keep accent colors down to a minimum. 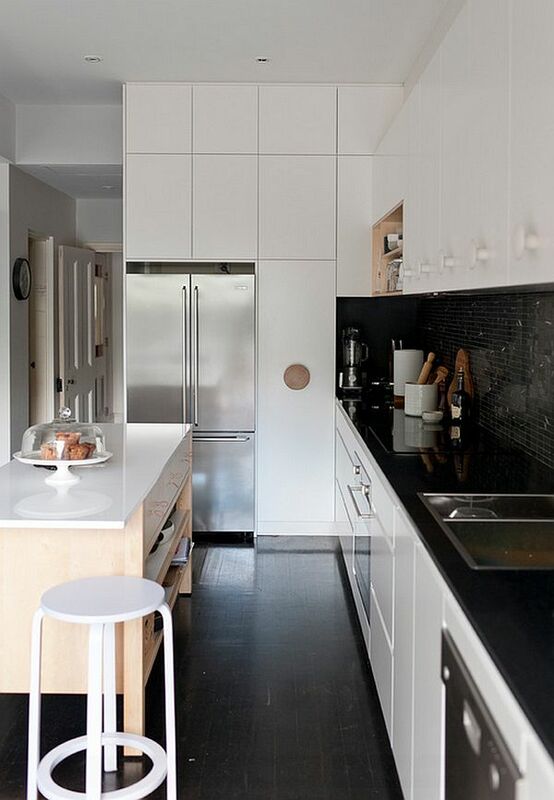 This is arguably the most important aspect of designing with black and white. 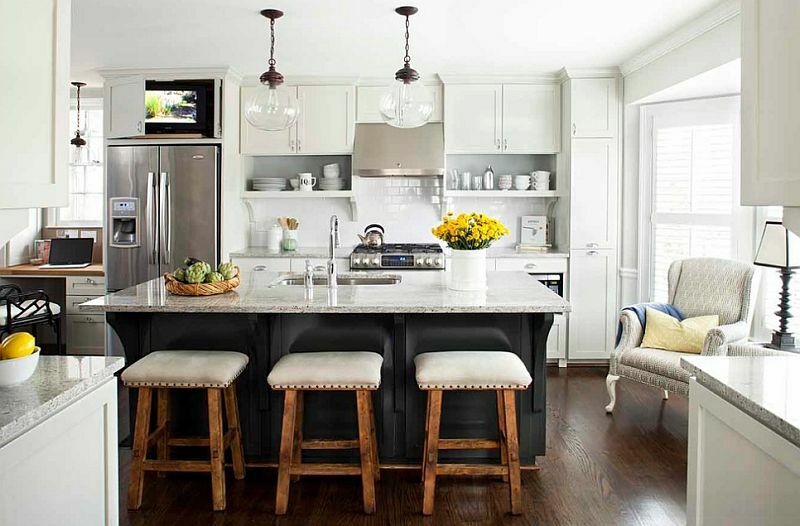 The balance between these too colors varies with the style of your kitchen, how it fits in with the remainder of the house and the size of the space on offer. 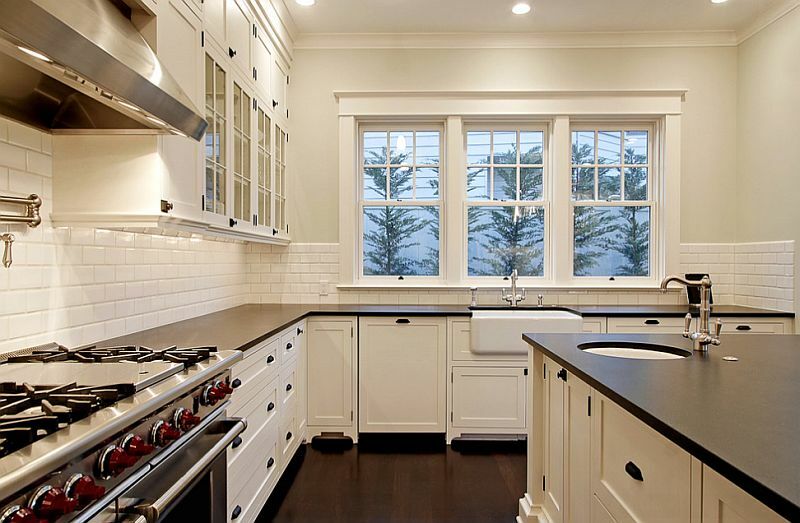 Most homeowners feel that there must be a more or less 50-50 split between both the hues. 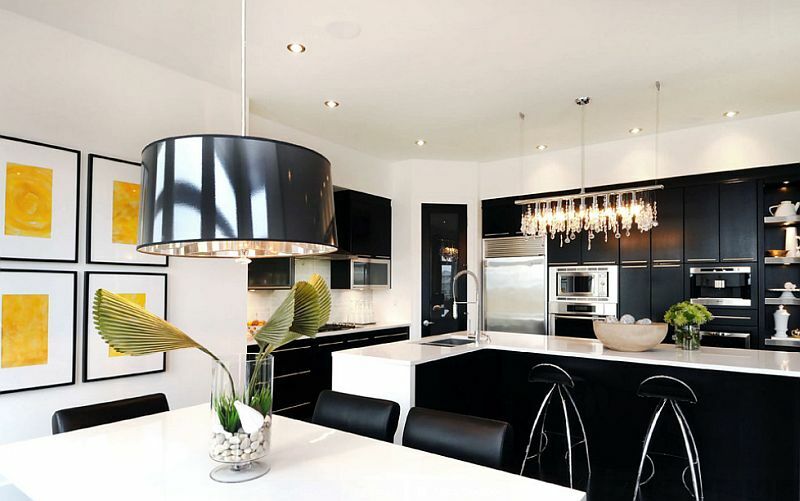 But that is far from the truth and in most cases it is better to use white as the major component and black as the color that highlights specific features and brings in the oomph factor. 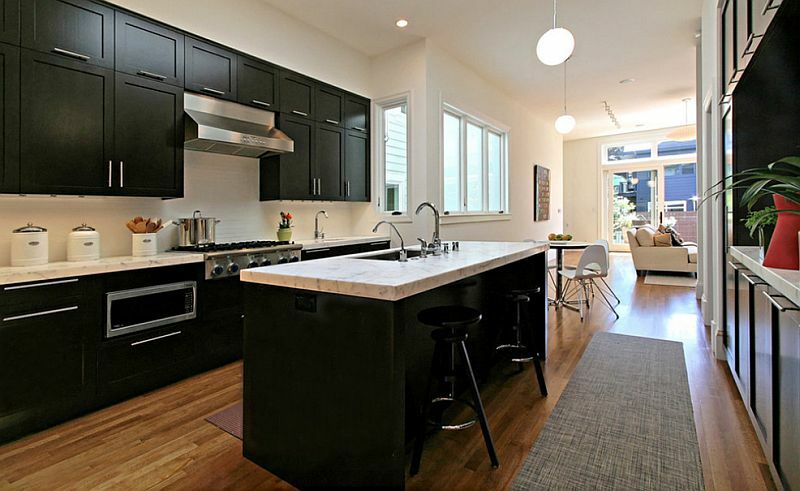 This is especially true in case of small kitchens where an overdose of black can lead to dreariness, making the space seem even more congested. 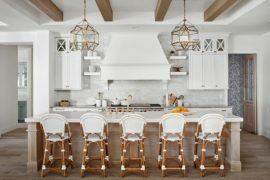 Just remember that balance does not mean using both the shades in exact same quantity! 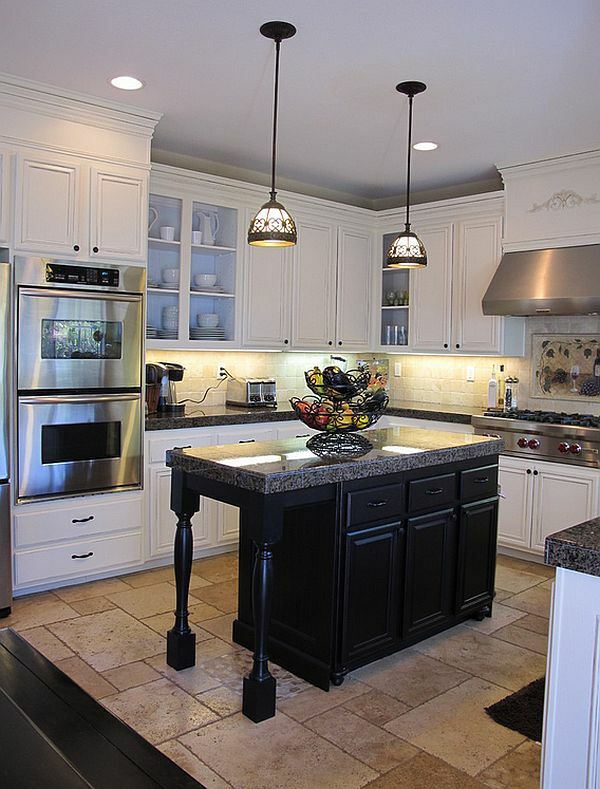 Lighting is another key factor that makes or breaks the black and white kitchen. 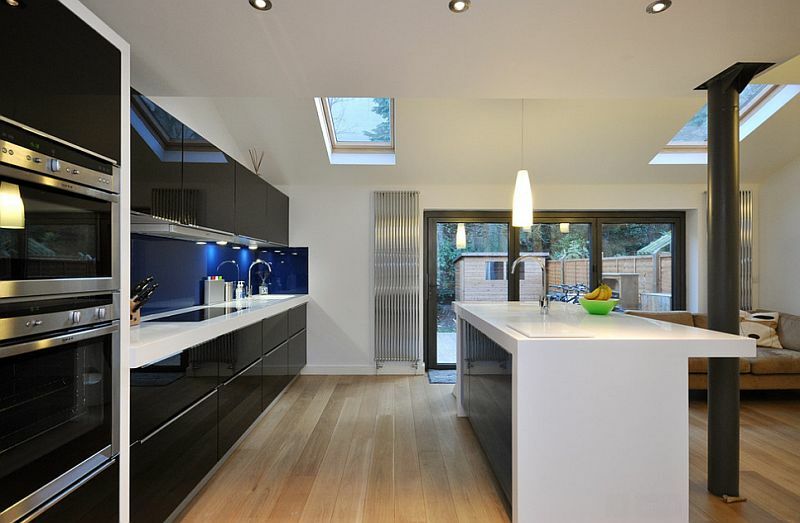 While good lighting is always important, it becomes even more significant when going for a monochromatic look. 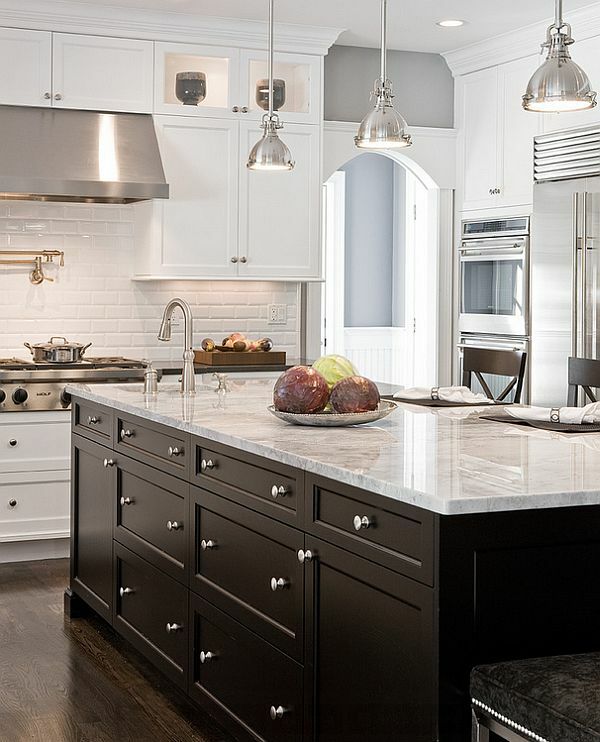 Combine smart pendants with beautiful sconces and recessed lighting to create multiple layers of illumination. 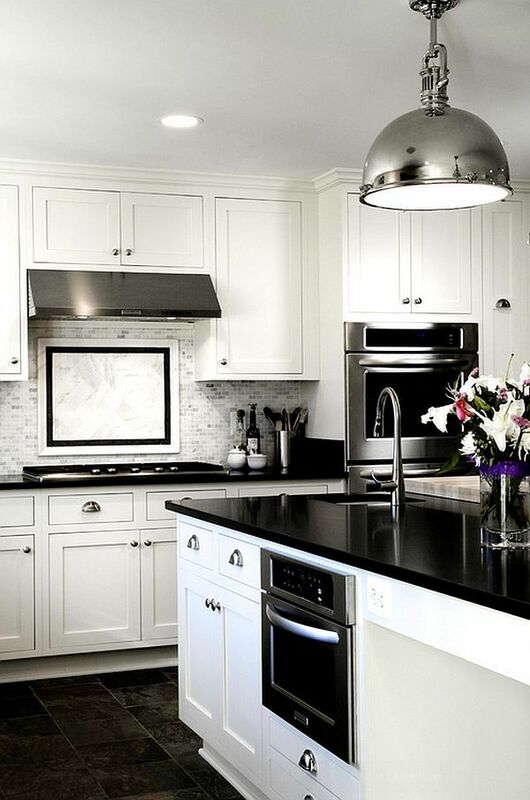 Get it right and you will have a black and white kitchen that is chic, cheerful and picture-perfect!